A militia sniper lies in ambush in the ruins of a war ravaged city. Alone, he operates once the fighting has stopped. One day, appears… a rat. Filmed during the violent Israeli offensive against Lebanon in the summer of 2006, "33 Days" tells the real life story of four people. A theater director who works with children who have taken refuge in a theater, a journalist who struggles to cover the war from a television station under fire, an aid worker who coordinates the distribution of goods to thousands of displaced people, and a news desk director who is trying to cope with the war as well as take care of her newborn. This film puts a face on the often anonymous horrors of war. About Home takes an inside look at a refugee camp 60 years later. Suha and Ahmad are two young Palestinian refugees born in Lebanon. 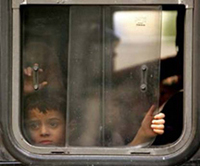 They are the second generation Palestinian refugees. Their hearts belong to Palestine but they have only seen their country on television.